Brandon Pettit, owner of Delancey and Essex, opened Dino's Tomato Pie on Capitol Hill! 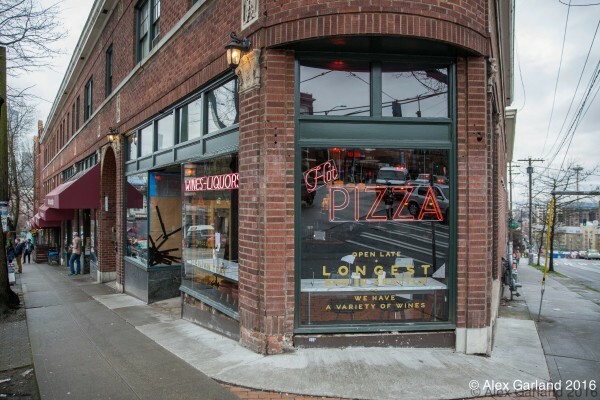 The new bar and pizzeria is on the corner of Denny and East Olive Way. Brandon is bringing his delicious pizza to Capitol Hill after having much success at his popular Delancey in Ballard. The pizza is not the same as those served at Delancey. It is served square and with a thick crust. The name of the new pizzeria is an homage to a New Jersey pizzeria called Joe's Tomato Pie. I can't wait to try the pizza at Dino's! I wish there were more places like this, because it was simply too amazing for words. I came here with my boyfriend the other night, and it was absolutely fabulous. The use of wood throughout the venues in San Francisco adds a very warm and inviting feel to venue. Get the best and certified used car at affordable price in India at Autocarbazar. It is a cars web portal where interested people can find good condition car. We also provides insurance facility for vehicles. Hey you have a great blog. Found you from Zamota. Do you want to do an interview about your food experience in the Seattle area on Northwestchefs.com? We could include a link to your website? Probably, of all the preferences, this casino is my favorite. superb slot machine tips I like everything in the casino, the roulette is excellent, I am glad that during the game you can also talk to people who also play at the same table! Muzychka great. With the conclusion there were no difficulties at all. Easily raised from $ 30 to $ 600, withdraw. Played, played, will play! With the advent of modern day living people are rising and moving in new cities and exploring new business opportunities. Because of this scenario there is always a demand for reliable and efficient packing and moving services. Taking this into effect the company of associate Packers and Movers is helping clients to shift to various location without any hassle. The whole process from packing of your items loading shifting and unloading is done with care by the staff of the Associate packers so that there is no problem to the client.